Times of India discreetly changed headline of a misleading article. Earlier today, we had reported how a Times of India report had force-fitted ‘Veda Pathshala’ in the headline on the story on child trafficking in madarsa in Chennai. 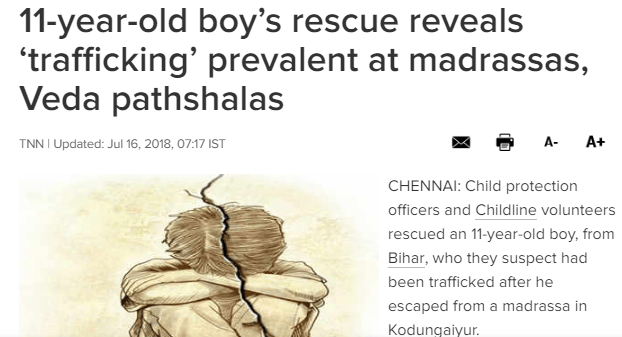 However, after being pointed out the by Twitter user Ethirajan Srinivasan that the report has no proof of any child trafficking from any ‘Veda Pathshala’ as mentioned in the headline, Times of India quietly changed the headline of the article, without really making any changes in the article. 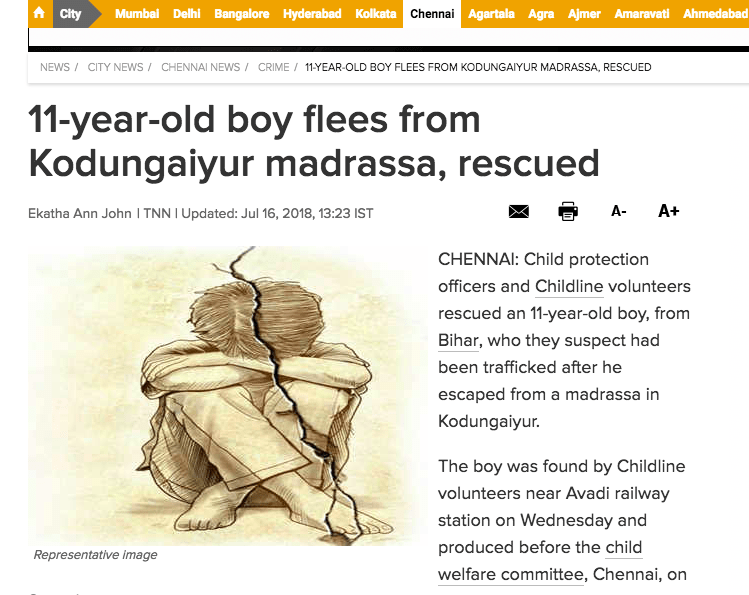 The news report in Times of India, written by a reported Ekatha Ann John, mentions the term Veda Pathshala only once in the report, “Since January, Railway Childline, Government Railway Police and the DCPU have rescued at least 25 children from Chennai who escaped from Madarsas and Veda Pathshalas located in the city and other districts.” But the article had no mention of specific cases or names of any Veda Pathshala. Interestingly, after change in headline, the story was not changed. Which means, the story still claims that Veda Pathshalas are also part of child trafficking network, albeit without any proof. Since last week, media is rife with reports from Jharkhand where two nuns of Missionaries of Charity were held for allegedly selling babies. Since then many details have emerged about the alleged child selling, duping, forgery and trafficking racket operational with links to the charity organisation founded by Mother Teresa. At the wake of such incidents, though it is fair to call for transparency and strict rules for religious residential institutions, dragging the name of an institution without data is unfortunate. Misleading headlines have often been used to paint a wrong picture or create an incorrect perception of a crime. Many times we see news headlines claiming a ‘tantrik’ or priest being involved in some crime with accompanying picture depicting Hindu symbols when the report is actually about perpetrators of other religions. Was this Veda Pathshala reference another such attempt? Amusingly, after changing the headline, has neither issued clarification nor put up a disclaimer about the change in the story published.